Only for Charming customers: welcome drink by the pool on arrival on the terrace overlooking the sea! enjoy, if you want, the best offers of the nightlife in “Costa”: trendy clubs, discos, restaurants and social events of all kinds. It is recommended to young couples looking for fun but also to more mature couples who want to explore the wonders of the coast. Here you will find an attentive and accurate service. Luxury Hotel situated in the town of Cannigione, Arzachena, Villa del Golfo Lifestyle Resort is a few steps from the most important centres of the Costa Smeralda. Meeting and social evenings place, Costa Smeralda with the centre Porto Cervo has the most beautiful beaches on the coast. The Villa overlooks the beautiful bay of the Gulf of Arzachena, and offers a panoramic view over Caprera Island. Villa del Golfo is easily reachable thanks to its proximity to Olbia (30 km) and its international airport Olbia Costa Smeralda. Elegant and refined, Villa del Golfo Lifestyle Resort is furnished in a typical Mediterranean style and offers a wide variety of high quality services. The privileged location overlooking the beautiful sea of the Emerald Coast makes it a beautiful place to relax and restore the body and the spirit, a few steps from the exclusive Costa Smeralda. Please note that children are welcome from 10 years. 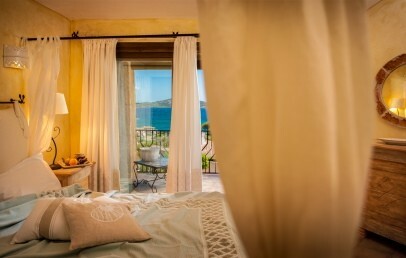 Classic Deluxe Sea View – are located on the ground floor in the main building, double rooms are characterized by soft colours and Mediterranean style furnishings. All rooms have an equipped terrace or veranda, air conditioning, bathroom with tub/shower. Superior Deluxe Sea View – are located in the main building on the upper floors, double rooms characterized by soft colours and Mediterranean style furnishings. All rooms have an equipped balcony, air conditioning, bathroom with tub/shower. Suite Sea View – they are located in a more independent area to ensure pleasant privacy, either in the main building or 150 m from it. They Suite surface ist 45 sq.m. + 15 sq.m. of veranda. They offer an exquisite sea view and feature a spacious furnished outdoor area. The bathrooms have a tub or only a shower. 3rd bed available for guests over 10 years. Superior Suite Sea View with private pool – fully independent from the main building, furnished in Mediterranean style that characterizes the Resort, the Superior Suite Sea View with private pool are developed in an area of 65 sq.m. and feature a large outdoor area with sofa, wicker chair and table. They have a porch and a private garden with a 25 sq.m. pool. All rooms have Jacuzzi shower. 3rd bed available for guests over 10 years. 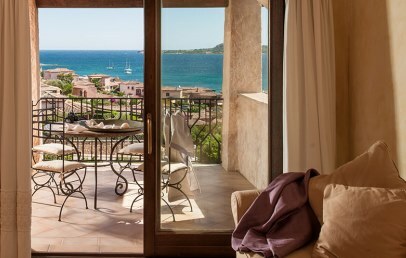 Luxury Suites Sea View with private pool – romantically inserted between the granite rocks typical of the Costa Smeralda and offer spectacular view. The exclusivity of services will ensure the success of your dream holiday. The service is personalized and attentive to every need: for every requirement, a butler will be at your complete disposal. They’re suitable for those seeking a romantic retreat, where spending their vacation peacefully, without sacrificing the pleasure and convenience offered by high-level services. The Suites do not have a kitchenette. Please note that, in these rooms, children are welcome from 12 years. The staff is available with a Golf Car for transfers from the Suites to the main building of the hotel and vice versa. The hotel offers beautiful views but it is not located directly on the beach and has no private beach. For hotel guests only, at 150 m distance, is a private beach wooden deck by the sea, well-equipped with loungers, sun umbrellas and beach towels. Here guests will find also fresh soft drinks and the assistance of a lifeguard (service with extra charge). Beaches with beach service are at approx. 1 km distance "Tanca Manna" and "Barca Bruciata" with complimentary shuttle service. Close to the hotel at approx. 200 m distance is a small beach, without beach service. The Beauty Centre and Spa Armonia offers comfortable spaces where guests can take care of their body. Guests can choose between emotional showers, sauna, Turkish bath, whirlpool, heated indoor counter-current pool and many others. Services to pay are the different kind of massages and treatments. Innovative is the use of materials typical of the region such as cork, mastic oil, extract of myrtle and arbutus honey. The restaurant “MiraLuna” offers a splendid panoramic sea view, being located on the terrace and is known for its good Mediterranean cuisine. It is open for lunch and dinner with fish-based and meat-based menu. On request, at MiraLuna Restaurant, special evenings can be organized with Private Wine & Food Tasting on the terrace or in the Hotel’s private Art Boutique. “Chiaro di Luna” exclusive dinner on the Yacht. Navigation towards the north-western part of the island, personalized menu, wine-pairing, champagne and private Chef. To book and to pay extra on-site. Acqua di mare is the restaurant on the private sea deck, where guests can enjoy an aperitif and dinner at sunset with live music concerts. The typical regional dishes are cooked with the fresh, genuine and local products of the farmhouse belonging to the "Agriturismo La Colti” (hotel property) and accompanied by top vines of the island. Cooking classes on request. The breakfast has large selection of sweet and salt dishes served on a buffet and from the menu it is possible to order hot plates just cooked on the moment. Every evening at the Lounge bar “MiraLuna” delicious cocktails with finger food can be tasted, this all with soft background music in an romantic atmosphere. The half board supplement, to be paid on site, is € 40.00 per person per day; a minimum of three half boards per person is required. The price includes four courses: an appetizer, a first course, a main course and a dessert; drinks are not included. A nice and big veranda with a sea water swimming pool and sun terrace, where guests can relax in front of the Bay of Cannigione. There is a fully equipped fitness centre (complimentary) as well as several common areas as a bar, billiard room, reading room with a small library with fireplace. The Villa del Golfo Lifestyle Resort offers a private yacht which can be rented to discover the beauty of the coast and for exciting excursions as well as an exclusive dinner on board. The hotel organizes also, on request, cooking classes and wine tastings, to promote and enhance the products of the Sardinia region. Villa del Golfo Lifestyle Resort has implemented a number of environmental initiatives including 100% electric cars available for daily rental. Battery charging points to be found in the Hotel’s private parking spot. The city tax is not included in the price and is to be paid on-site. Early check-in a/o late check-out – suggested to book in advance the Day Use (by booking confirmation). Supplement of 85% of the official rates (rack rates). The hotel is suitable for children over 10 years. 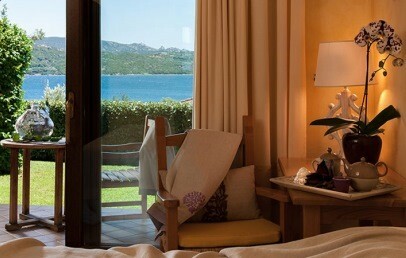 Romantic and Luxury Suite, nests among the typical granite rocks of Costa Smeralda. 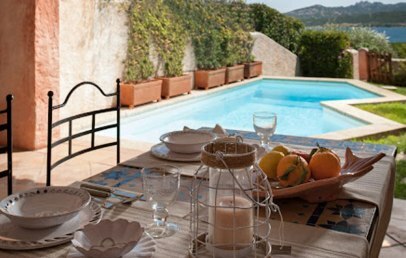 Decorated with prestigious furniture in typical Sardinian style, with soft forms and elegant architecture, the Suites welcome guests in a refined and comfortable setting. The bathroom has a tub or shower, hairdryer, slippers, bathrobes, complimentary toiletries. The outdoor area is equipped with comfortable arm-chairs, table and sun beds and a private pool of 25 sq.m. nestled in the manicured garden. The Luxury Suites have a wonderful sea view and offer additional exclusive services such as a housekeeper, room breakfast service and private parking. The Suites are located at the top of the hill, 200 meters from the central area (the staff is available to pick up the clients with the golf-car). Please note that, in this room, children are welcome from 12 years. Elegant and large Suite with living area, located either in the main building or in the annexe building at 150 m distance (the staff is available to pick up the clients with the golf-car). They are characterized by soft colours, light wood furniture, ceramic floor and furnishings of the Mediterranean style. The bathroom has a tub or only a shower, hairdryer, slippers, bathrobes and complimentary toiletries. 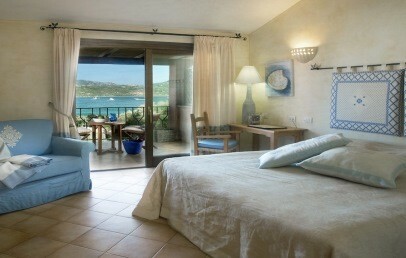 The Suite offer an marvellous sea view and a veranda or a balcony elegantly furnished. Exclusive suite, independent from the main building at 150 m distance (the staff is available to pick up the clients with the golf-car). Characterized by soft colours, light wood furniture, ceramic floor and Mediterranean-style furnishings. The living room has a 3rd bed. The bathroom has a Jacuzzi shower, hairdryer, slippers, bathrobes, complimentary toiletries. The outdoor areas are fully equipped with sofa, wicker sofa, arm-chair, table and sun beds. Some of them offer a garden with patio and private swimming pool (25 sqm). The rooms are located in the main building on the ground floor with a terrace and are characterized by elegant furniture in Mediterranean style, typical for the Emerald Coast, with various bright colours, wood furniture and ceramic floors. The bathroom offers a tub/shower. The double rooms are located in the main building on the ground floor with a terrace and are characterized by elegant furniture in Mediterranean style, typical for the Emerald Coast, with various bright colours, wood furniture and ceramic floors. The bathroom offers a tub with shower. The Classic Deluxe rooms have sea view. The double rooms are located in the main building on the upper floors and are characterized by elegant furniture in Mediterranean style, typical for the Emerald Coast, with various bright colours, wood furniture and ceramic floors. The bathroom offers a tub with shower. The Superior Deluxe rooms have a balcony (8-10 sq.m. surface) with sea view.